If you have a child with CAS (childhood apraxia of speech), then you are probably aware that verbal communication is a bit of a…well, challenge. It may also come as no surprise that reading and writing may also be a challenge for your little one with CAS. You will likely start to see this struggle as your kiddo hits the later preschool years (Pre-K) moving into kindergarten. Since it’s summertime, it may be a great time to practice these skills without the pressure to perform. You and your child can progress at a rate that is comfortable to you….and come fall, your child with apraxia is ready to put those hard-learned skills into action. 1. Kids who aren’t making sounds accurately–or at all–may have a decreased visual of what letters look–and sound like. 2. Kids with speech-language disorders may have a distorted sense of what the symbols (those things we call “letters”) represent (words). 3. Children with apraxia may have “differently wired” brains, affecting what–and how–they read, learn, and interpret information. 4. Children with apraxia may have a decreased ability to coordinate the vocal track in producing a word. If that all sounds like blah, blah, blah to you…bear with me. It’s not nearly as mysterious as it sounds. So, What’s a Parent to do?! Read, Read, Read! You can start with a love for reading. Let your child see you reading. Really, anything counts…magazines, books, newspapers. Just the fact that you are reading sets the stage for your child to do the same. But also read with your child. Start out with repetitive books. Those stories that are predictable may be boring to you, but for your child they bring to life the idea that they can predict what is going to happen next (a very empowering skill), plus, they are easier to memorize in which it may look as if your child is “reading” it on her own. Next, you can have your child discriminate rhyme. “What rhymes with Sam? Am or eggs?” The sillier the better. Then have your child produce rhyme. It works like this: “I am thinking of a word that rhymes with Sun, but starts with /f/ [fun]. Just make sure you make the sound of the letter /f/ and not say, F. (A great activity to do on those summer road trips). We’ll, talk more about helping your child with reading skills next week on “Apraxia Monday.” Stay tuned, too for later weeks on writing skills. 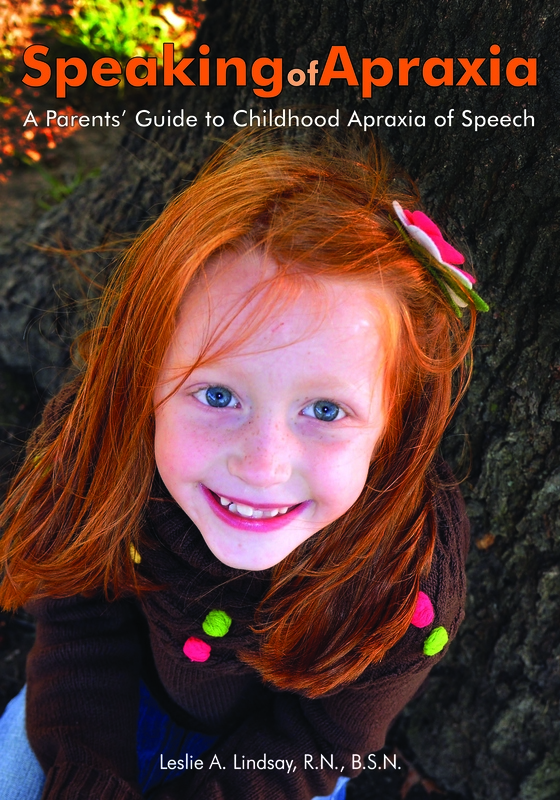 Check out these blogs for a review of Speaking of Apraxia (Woodbine House, March 2012) and a chance to win a FREE copy of the book, where you can learn more information about helping your child with school-based skills like reading and writing in chapter 12. WORDS OF HIS HEART http://wordsofhisheart.wordpress.com/2012/06/07/speaking-of-apraxia-a-parents-guide-to-childhood-apraxia-of-speech-by-leslile-lindsay-r-n-b-s-n/.